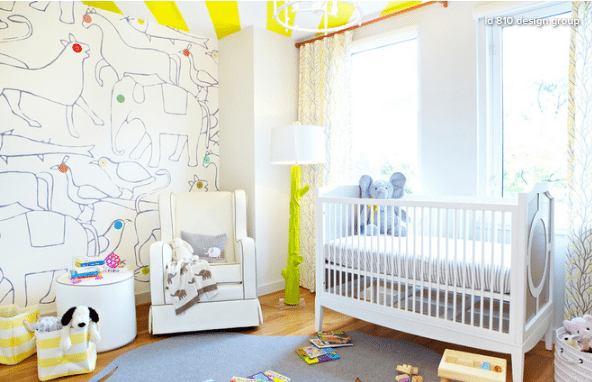 First-time homebuyers expecting a baby asked their designers to create a gender-neutral nursery in their newly built Brooklyn condo. The result is a fun, inviting space that feels larger than its dimensions. When Lana and Steven Kleiman were expecting their first child, they also bought their first home — a new condominium in the Carroll Gardens neighborhood of Brooklyn. 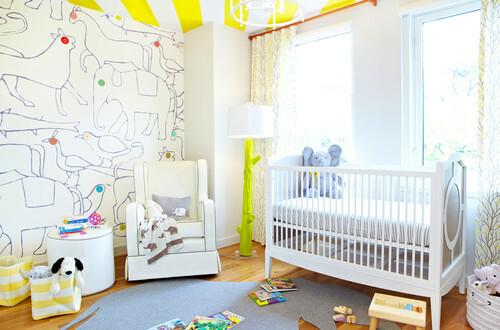 The Kleimans hired Jessica Geller — a designer Lana had grown up with — and Virginia Toledo to take on the three-bedroom condominium, including the nursery for their new baby. Geller and Toledo started with the wallpaper, from Minakani in Paris, which Lana had spotted in a magazine. The company stretched the scale of the animals to fit the scale of the room. 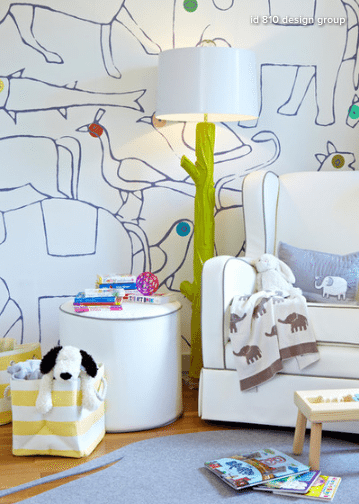 Designer and blogger Emily Henderson also used the wallpaper in her own son’s nursery, and Toledo noticed that the popularity of the print subsequently soared. 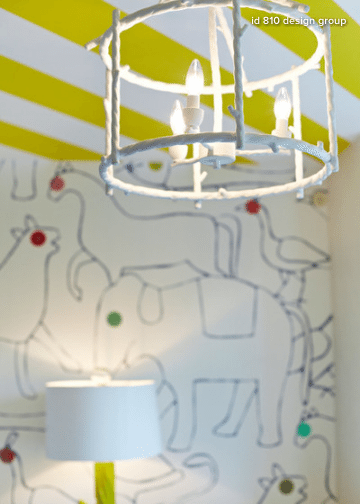 To create a greater sense of volume in the small, somewhat boxy room, Geller and Toledo created a diagonally striped ceiling using Benjamin Moore’s Super White and Sunny Afternoon paint. Geller and Toledo selected a crib that has traditional white slats, but with a twist in the form of a silvery, champagne-colored finish for the detailing at the crib’s ends. “It’s a little more special than just a painted gray color,” Geller says. The yellow and gray twig-print drapery fabric echoes the tree-like shape of the chartreuse lamp. “We picked that chartreuse color to add that unexpected element that is a vibrant and fun injection into the room,” Geller says.